Winter is probably the biggest event in a gardeners life. Summer comes slowly but winter seems to come on strong, wilting even the toughest plants. We bury our plant pots in the ground if the plants are zone 4 or more. Because you lose a zone and a half if a plant is left in a pot above ground we always make sure the pot goes in the ground and is filled around with soil. Other nurseries use sawdust to cover the plants but we find it encourages mice and that is never good. So, until next spring put your garden to bed and enjoy the frosty mornings...... Summer is here, the rain won't let up, but we all know that the hot weather is just around the corner. 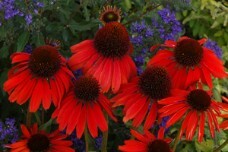 Now is the time to finish planting so the new arrivals in your garden have a chance to adjust before the heat arrives. Watch for upcoming Seedy Saturdays we are sure to be there too. It is not yet time for us to open on Sundays, Keep an eye on this page for updates. Directions . Drive east on hwy 1 from Kamloops, exit at Lefarge, follow the bright green "plant sale" signs until you reach our driveway on the left. We book garden clubs and visitors on special days, this helps us focus on our busy schedual, and you, as we can then focus on your needs. Please check this page during the year for our specials and gatherings at our farm. Plan a beautiful drive along the South Thompson River on a Sunday afternoon. Herbs and many interesting types of tomatoes and peppers are featured in our lineup because of popular demand, come and see what we have to offer. This year will be a very busy and exciting one. We are always surprised by what is popular and what is not. It's impossible to second guess people when it comes to their choices in plants.